But first, here’s my confession: it’s not just the pizza that draws me to both locations of Pizza Bella. It’s the Brussels Sprouts. Roasted in a wood-fired oven, tossed in a vinaigrette with dried cranberries and almonds. Oh so good! Any of the pizzas are available on a gluten-free crust. On our most recent visit, we had two pizzas (and lots of leftovers). The first pizza we had was the Roasted Eggplant. 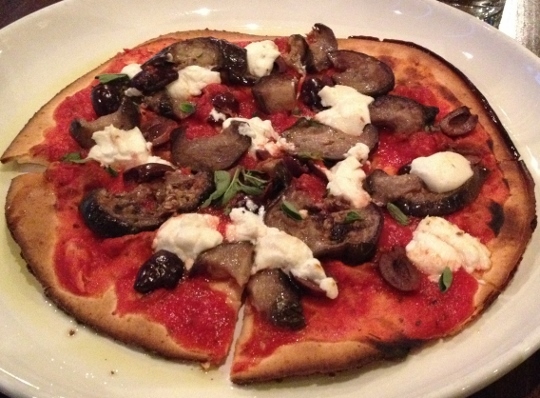 A crispy gluten-free crust topped with tomato, olives, goat cheese, oregano and, of course, roasted eggplant. This is my go-to pizza. The roasted eggplant is almost creamy on the pizza. Because of this pizza, I’ve discovered I really like eggplant and goat cheese together. The second pizza we had was the Potato. 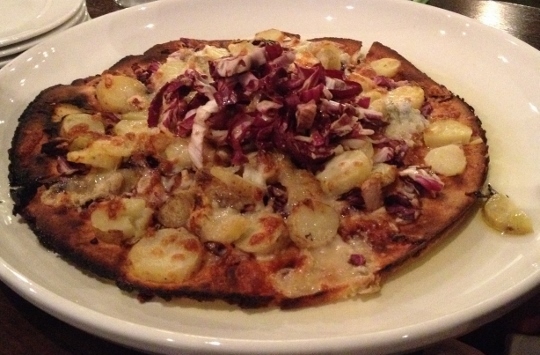 Another crispy gluten-free crust, this one topped with fingerling potatoes, Gorgonzola, radicchio and a drizzle of balsamic. I love potatoes on pizza! 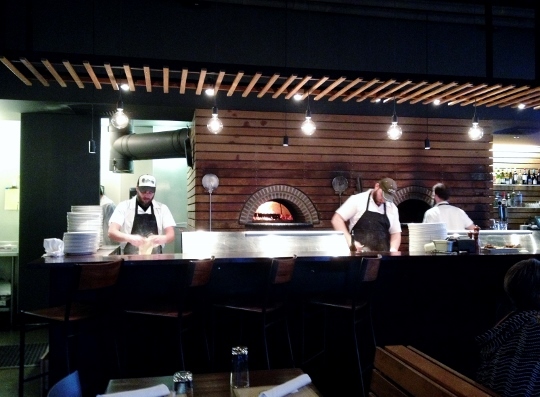 At both locations, you can see the gorgeous wood-fired ovens in action. Seating is comfortable and both locations are quite comfy, with lots of rustic wood tones with modern furnishings and minimalist light fixtures. We meet friends for pizza at Pizza Bella, we’ve celebrated birthdays at Pizza Bella. I’ve been there in my fancy pants and my yoga pants. It’s a comfortable place for a delicious meal with many locally sourced ingredients. Oh, and beverages! You want to know about that, too, right? There is a featured hard cider available. It changes seasonally, so be prepared for a new indulgence every few months. One last tidbit: if you are a fan of gorgeous food photos, visit Pizza Bella’s website. I don’t suggest doing this on an empty stomach though. The photos are droolworthy! Eat With: A Bit of Caution. The staff are sometimes more knowledgeable than others, but all have been quick to ask the kitchen staff when I’ve had questions they couldn’t answer. Just make sure to clearly state your dietary needs so the server understands. Pizza Bella has locations in both Kansas City, Missouri and Overland Park, Kansas. The photos in this post were taken at the Overland Park location. Pizza Bella KC is located at 1810 Baltimore, Kansas City, MO. 816.471.3300. The Overland Park location is in the Mission Farms area, 4000 Indian Creek Parkway, Overland Park, KS. 913.341.7700. Awesome! I live in Overland Park and I’ve never even heard of Pizza Bella before now. I can’t WAIT to try their pizza and Brussels sprouts too!!! Great photos by the way! Yay! I hope you’ll report back, Dana. I love to hear what pizza folks try at Pizza Bella. 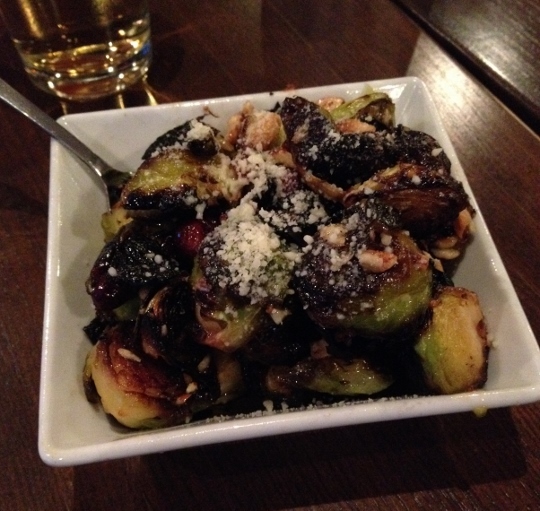 The Brussels Sprouts are awesome!! I love the pizza too, but oh those Brussels Sprouts.